What attracted you to the position of executive chef at a hospital? 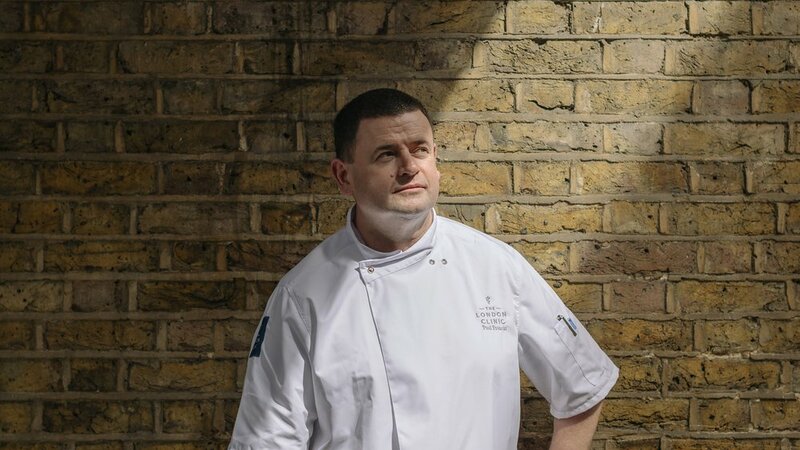 Bringing a chef in from a Michelin-starred restaurant background is a bold move by The London Clinic. In those kitchens you strive for excellence—the customer experience is everything—but it is no different here. I wanted to take all the wonderful ideas I see happening in restaurants, on street food stalls, in markets, and bring them into the hospital environment. The reputation of hospital food is not great in both the public and private sectors and I wanted to be part of changing that. What are the main differences between a restaurant kitchen and a hospital kitchen? The biggest difference is the need to learn the clinical aspects of serving food to people who are unwell and undergoing what are sometimes quite intensive treatments. While the food available must be delicious, even more important is that it helps them recover. I need to understand nutrition at a level that’s simply not necessary for a restaurant chef. How does the clinical aspect of your job work? My main points of contact are the dieticians. These are the specialists who know what nutrition each patient needs for their recovery. They also advise me on the clinical aspects affecting the food provided. For example, they will tell me if a particular patient is neutropenic. Neutropenia is a condition where the patient has very low levels of a type of white blood cell important to fighting off infections. It is often associated with cancer treatments and leaves the patient’s immune system compromised. It means the patient needs thoroughly cooked food. If we gave them raw salad leaves, these would contain some bacteria, no matter how well they were washed. That would increase the risk of the patient picking up an infection, which you have to avoid at all costs. We are determined that these patients should not have a lesser dining experience, though. 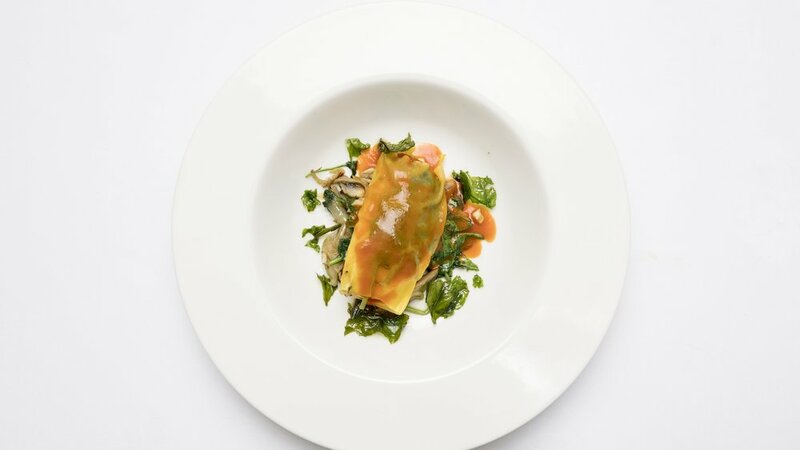 Our neutropenic menu includes dishes like baked miso cod fillet with black quinoa or goat’s cheese and truffle cannelloni with wild mushrooms. How does the relationship with the dieticians work? Twice a week I will sit down with them to talk through all the patients who have specific dietary needs. We focus in on those who have clinically restricted diets and those whose needs may have changed due to the nature of their treatment. So, they may tell me a patient has become neutropenic, or that they have a patient who is struggling with their food and needs a visit from me to talk through meal options to improve food intake. Give us an example of something that a dietician might tell you about a specific patient. We had a 60-year-old lady with us recently, a lovely woman. The dieticians told me she needed to get as much protein as possible. However, she was on what we call ‘free fluids’, which means that she couldn’t eat solid foods. My job was to get plenty of protein into her while keeping the food interesting. One method is to use chicken broth as a base for other soups, which meant that she was getting her protein without having to eat chicken soup for every meal. Also, she really liked fish and chips, so I found a way to get those flavours to her in liquid form. That must have taken a lot of effort. Why go that far? When someone is in hospital, the food should be far more than just a nutrient delivery system. People have strong emotional connections to food and if you get it right you can make a huge difference to their psychological wellbeing. This particular patient was here for her 60th birthday and she asked me to make a cake for a family visit. We made the cake for the family but I took some of the cake and turned it into a milkshake, so she could feel part of the celebration. The psychology of recovery is so important and food can play a very beneficial role. How do you manage the basic menu? We have an à la carte menu and also a weekly special menu with three starters, mains and desserts, and this cycles through variations once a week. We aim to change the whole menu about three times a year, which is a huge process. Clinical considerations mean we have to examine every item we source. Some of our patients are seriously ill, so we must have absolute trust in the quality and integrity of our suppliers. Also, our halal and kosher suppliers, for example, must be beyond reproach. How do you deal with people’s religious needs? A patient’s religious observance is central to their lives, and we must respect that. During Ramadan, Muslims cannot eat between sunrise and sunset, yet we have to make sure their nutritional needs are met. The catering team will visit the patients and talk through the options. Some will suspend the fast during recovery or come to an acceptable compromise with the blessing of an imam. Others keep to the fast and we will schedule their meals accordingly. Special menu options are available for our patients and their visitors throughout the Ramadan period. Then there are festivals where it is traditional to either eat or avoid certain foods. We produced some traditional Passover dishes for our Jewish patients this year. We will always do whatever we can to make the patient happy and comfortable. How often do you see patients? I will see around 10 patients every day, to talk about their menu needs. For instance, when a patient has lost their appetite and is not eating, I will go and visit them. I’m gentle, but straight about what they need. I say: “You do need to eat something. What do you feel you can face? If you were at home, what would you choose to eat?” From what they tell me, and after discussion with the dietitians, I decide what I can do. If they really fancy a chicken korma but are on a low residue diet—which means we need to rest their intestines by using foods that are very easily digested—I will figure out a way to recreate a chicken korma experience. It is hugely gratifying when you hear that after one of those meetings the patient has started to eat again. Can treatments affect a patient’s tastes? Your body can react differently to food as a treatment progresses. A patient might love something today and hate it tomorrow. Some have gone in for treatments and come out with different taste sensations, or their taste buds have been temporarily dulled. In the latter case we will over-flavour the food for that patient. This is not just a case of chucking in salt and spices—it involves cooking in a way that intensifies the flavour, such as reducing sauces a bit more than usual. We also have things like sorbets that can help bring the dulled taste buds back to life again. You might think it would be learning the clinical side, but it wasn’t that; it was more the challenge of getting the troops to rally around what I was doing and the changes I wanted to make. I also needed to get the dieticians to trust and believe in me and understand my respect for their work. Thankfully, there is a great team in place here and we all work together to provide the best patient experience. What do you like best about it so far? I love those moments when you connect with a patient. Food can be a very personal thing and a crucial part of the experience of a patient’s time with us. When a patient tells me that they really enjoyed my food and it has made a positive difference to their stay, I see that as the equal of any accolade. It is very humbling.